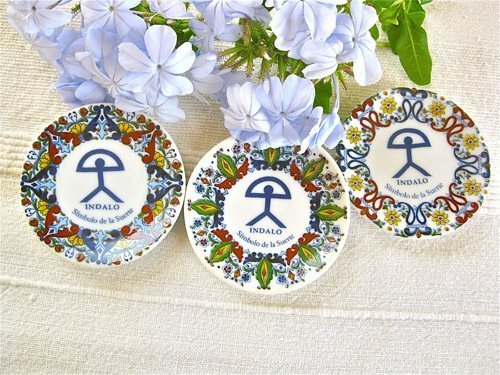 If you want your friends to start the day with a smile on their face, then send them one of these pretty multi-coloured Indalo fridge magnet "mini-plates". They are crafted in Spain and feature the lucky Indalo, recognized as a symbol of protection and good luck, particularly in the southern part of the country. Send your friends some Mediterranean cheer and lots of warm, lucky wishes to brighten their day. Detail: Each mini-plate fridge magnet measures 6cms in diameter. The Spanish words 'Símbolo de la suerte' (symbol of good luck) are written under the Indalo. The mini-plate fridge magnet you order is hand-painted so its pattern may vary a bit from these sample designs shown, but it will be very similar. What a beautiful little gift to say "I'm thinking of you and wishing you the very best." Comes gift-wrapped, like all our presents (with an information card about the Indalo) - and we can print a personal message on your behalf.